I have heard much talk about Ferguson and racial segregation in my personal life, as well as in the classroom. Conversations about Ferguson have abounded in my Civil Rights class this year as well as in the broader university community. It could hardly be otherwise. We are just 15 miles away from Canfield Drive. As a historian, I aim to help my students understand Ferguson, racial segregation, and all concomitant issues in a broader historical framework. How did we get here? How has that path shaped how we think and talk about contemporary segregation and racism in our classrooms, churches, coffee shops, homes, and other places of social gatherings? I assign a plethora of primary source materials to accomplish this task. The work of psychologists Kenneth and Mamie Clark offers a treasure trove of primary documents that can aid in such conversations. The Supreme Court’s decision to overturn “separate but equal” in the Brown v. Board of Education Case of 1954 relied heavily upon the Clarks’ well-known doll experiment and coloring test in which black children associated positive attributes with white dolls and crayons, and negative characteristics with black dolls and crayons. The court, in turn, ruled that segregation had a negative impact on black school children’s development. 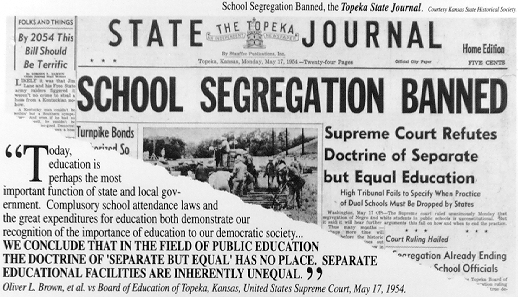 The Justices unanimously concluded that “Segregation of white and colored children in public schools has a detrimental effect upon the colored children…to separate them from others of similar age and qualifications solely because of their race generates a feeling of inferiority as to their status in the community that may affect their hearts and minds in a way unlikely to ever be undone.” In essence, the court ruled that segregation and white supremacy caused black people moral and psychological injury. However, the Clarks did not limit their analysis to black children. In the brief they filed with the Supreme Court in the Brown v. Board of Education case, The Effects of Segregation and the Consequences of Desegregation, the Clarks indicated that segregation also had a detrimental effect upon white children. The brief engages a number of issues, including that segregation teaches white citizens “to gain personal status in an unrealistic and non-adaptive way,” and “encourages them to direct their feelings of hostility and aggression against whole groups of people.” The report goes on to detail how segregation cultivates within white citizens “patterns of guilt feelings, rationalizations and other mechanisms which they must use in an attempt to protect themselves from recognizing the essential injustice of their unrealistic fears and hatreds of minority groups.” Moreover, the Clarks found that segregation feeds an ethos of “disrespect for authority” among white children. These findings were not listed in the Supreme Court decision. As Sherrilyn Ifill, president and director-counsel of the NAACP Legal Defense and Educational Fund, Inc., has pointed out, the findings were scarified on the altar of pragmatism in exchange for a unanimous decision. Chief Justice Warren believed a unified ruling would give their decision more force. Make no mistake: Segregation was not the result of a few bad actors—it was a government-sponsored policy. However, to concede this and to acknowledge that segregation created forms of white pathology proved too much for the court. Segregation was exclusively a black ailment. Exposing students to this short brief, The Effects of Segregation and the Consequences of Desegregation, has been a wonderfully generative classroom exercise/assignment. Reading the brief helps students to frame the conversation in historical terms. It enables readers to ponder how the problems of segregation and white supremacy cross the color line. Moreover, it also helps students to see how conversations about race, segregation, and white supremacy have historically and continually devolved into debates concerning notions of black pathology, while ignoring the ways in which institutionalized and systemic racism has historically and perpetually buttressed white supremacy. The brief can help all of us see that segregation and white supremacy are indeed a national problem, a shared problem with tentacles that reach far and wide. To put it in theological terms: Segregation distorts all human personality—yes, even white people. Lerone A. Martin, PhD, is Assistant Professor of religion and politics in the John C. Danforth Center on Religion and Politics at Washington University. This essay appears on the Wabash Center blog Race Matters in the Classroom and appears here by kind permission of the author and the Wabash Center. I have lived in a number of different countries where I resided among many different nationalities (I am British White). It is interesting to note that in the discussions about racism, we tend to focus on racism against Blacks, not tackling the issue of Blacks sometimes being racist against Whites. Then there is also the racism between other groups like Chinese and Japanese, Indian and Pakistani. What we need is to encourage a better understanding of how God sees each human being unique and special, whatever the colour, class, ability, size, gender, etc, based on principles from the Bible centering on His love for us and the command to love each other including our ‘enemies@ in a wholistic way. God bless you.